Trump Ditches G20 Presser "Out Of Respect" For GHWB - Joe.My.God. President Donald Trump has postponed a press conference designed to tout the “great success” of the Group of 20 meeting in Argentina, citing the death of former president George H.W. Bush. Via Twitter, the president said on Saturday that he would wait until after his return to the United States to brief the press on the confab of the world’s largest industrialized nations. G-20 leaders have agreed to address reform in the World Trade Organization (WTO), maintain current efforts on climate change, and progress taxation of the digital economy, according to a draft seen by Reuters. 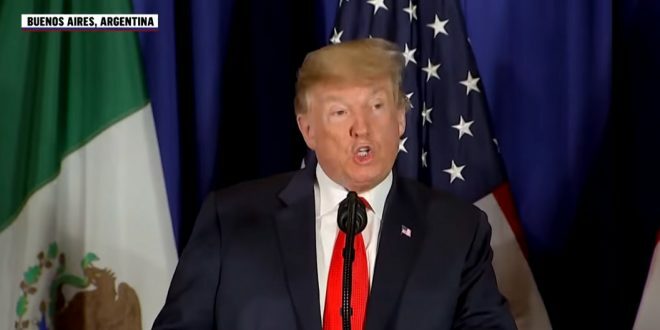 I was very much looking forward to having a press conference just prior to leaving Argentina because we have had such great success in our dealing with various countries and their leaders at the G20…. ….However, out of respect for the Bush Family and former President George H.W. Bush we will wait until after the funeral to have a press conference.